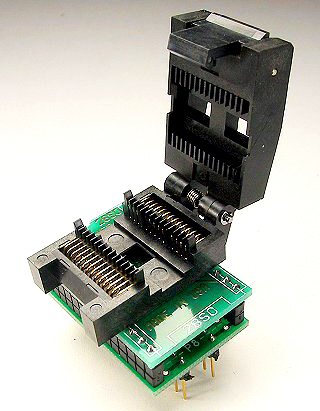 SOIC Programming adapter for 354 mil body, 457 mil overall SOIC package. Adapter wired 1-1. 300 mil span DIP plug. Top Side; Pins: 28 Pitch: 0.050"
Bottom Side; Pins: 28 Pitch: 0.100"